The idea to assemble a group of friends, and excellent musicians who were interested in French orchestral repertoire that had not yet been recorded, was the fundamental concept to the formation of this new ensemble. Not only has this music ever been recorded or performed, there are no modern or complete editions since so much of this music survived only in a reduced form (missing much of the harmonic structure). Le Concert d’Apollon aims to produce new and more complete editions of this grandiose repertoire. We wish to realize this music in a historically informed manner while still creating a unique and exciting performance atmosphere by introducing the dichotomy between a small ensemble and an orchestral setting (trios vs. tous). Exclusive and fresh transcriptions are included in our repertoire. The ensembles name was inspired by the Greek god Apollo, god of the Sun and the Arts. Louis XIV saw himself as such a god and lived his life accordingly. During the Sun King’s extravagant reign, the French orchestral ideal was reached, as exhibited in the works of Lully and his disciples. Directed and lead by João Rival, who graduated with a Master in Harpsichord Performance from the Koninklijk Conservatorium Den Haag (Royal Conservatory, The Hague) in 2014 and now specializes in French Baroque orchestra and keyboard repertoire. Currently Rival is perusing a PhD in analytical reconstruction of the music from the turn of the 18th century in France and hopes to use this new orchestra as a platform to demonstrate his research. Membership of the ensemble varies. The minimum musicians needed to perform these works is 15 and for the larger productions 25 to 35 (always including strings, winds, percussion and continuo). We are also interested in collaborations with singers in order to demonstrate the entirety of the French Baroque arts. Concerts in The Netherlands and abroad, spreading a new way of performing French baroque music on period instruments. Editions and recording from Marais Alcide (1693) and orchestral suites Arianne et Bacchus (1696). João received his Bachelor’s Degree in harpsichord from the StateUniversity of Rio de Janeiro (Brazil) where he studied with Marcelo Fagerlande. João has had the chance to extend his knowledge with notorious harpsichordists such as Elisabeth Joyé, Olivier Baumont, Nicolau de Figueiredo, Patrick Ayrton and Jaques Ogg. He was awarded lessons with Huguete Dreyfus during the Académie Musicale deVillecroze (France), 2006. In September of 2008 he was admitted as student of Jacques Ogg at the Royal Conservatory in The Hague (The Netherlands), receiving his Bachelor degree in 2012 and Master degree in 2014, narrowing down his studies in French harpsichord transcriptions from orchestral works of Marais and Rameau. In 2010 he attended L’académie Baroque Européene d’Ambronay as a continuo player for an adaptation of Rameau’s opera Les Indes Galantes under theleading of Hervé Niquet. 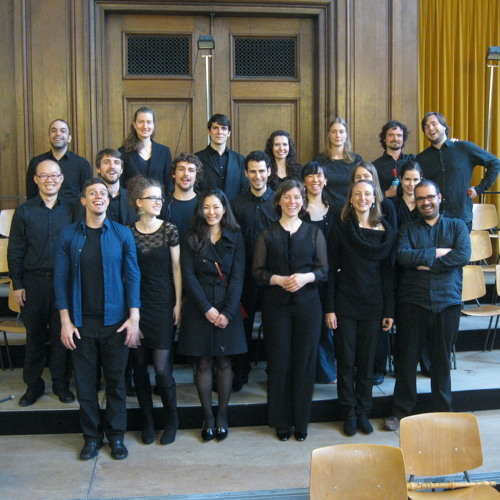 In May 2014, João had the great opportunity to work for Rameau’s Les Indes Galantes in a coproduction of The Royal Conservatory and the orchestra of the 18th century under the leading of Frans Bruggen. Also in the same year, he created the ensemble Le concert d’Apollon, specialized in French orchestral baroque music. Elise van der Wel studied the violin at the Koninklijk Conservatorium in Den Haag with Theodora Geraets. Because of her growing curiosity in the historically informed concert practice, she changed to the Early Music department on the same school and fell in love with the sound of the baroque violin. She studied with Katie Debretzeni and Walter Reiter and obtained her bachelor diploma in 2015. At the moment Elise is studying in the Master-program at the Early Music department of the Conservatorium in Amsterdam, where her teachers are Shunske Sato and Sayuri Yamagata. Elise plays on an instrument kindly lend to her by the Nationaal Muziekinstrumenten Fonds. Marianna was born in Poznań, Poland. She began her musical education playing piano and singing in a choir. She studied percussion at The Ignacy Jan Paderewski Academy of Music in Poznań. Under the influence of her marimba teacher, Katarzyna Myćka, Marianna decided to leave Poland and to develop her skills abroad. After a 6-month student exchange in Spain she enrolled in the Koninklijk Conservatorium in The Hague. In the meantime, Marianna was invited to take part in the Chicago Jazz Festival with Orbert Davis’ Chicago Jazz Philharmonic.Currently living in The Netherlands, she is completing her Master degree researching the field of early percussion. Marianna is a member of Mitomani multistyle folk group and collaborates actively with ensembles such as Slagwerk Den Haag and LUDWIG. Alon was born in Israel. He studied at the Jerusalem Music Academy. In Israel, he is a member of the Barrocade Ensemble. Alon graduated from the Royal Conservatory of The Hague where he studied viola da gamba with Mieneke van der Velden, Philippe Pierlot and historical double bass with Margaret Urquhart. In The Netherlands, Alon has played with conductors and ensembles such as Frans Bruggen and The Orchestra of the 18th Centaury, Peter van Heyghen, Patrick Cohën-Akenine, Symphonie Atlantique, NordBarok, Stichting Dutch Baroque, Ton Koopman, Circulo Bach in Madrid and others.In the summer 2014 Alon won 1st prize at the AMUZ (Antwerp) chamber music competition.Alon has played in festivals such as the Utrecht early music festival, Potsdam Sanssouci Festival, Eilat Festival for Chamber Music, Dordrecht Bach Festival, Abu Gosh Festival and others. Silvana Scarinci researches Seventeenth-Century music, especially Italian and French music under interdisciplinary perspectives, with emphasis on literature, gender and the classical tradition. She published a book (with a CD) on Barbara Strozzi (EDUSP and ALGOL publishers, 2008). She is an active lutenist and has acted in major productions and Early Music Festivals in Brazil and abroad; she directs the Early Music Laboratory (LAMUSA) responsible for the production or editing rare XVII C. operas: currently, they are working on a critical edition of Marin Marais’ opera, Ariane & Bacchus . She is a Professor at the Universidade Federal do Paraná, Curitiba, Brazil. Originally educated as an art historian, Judith eventually followed a second passion became interested in Early Music. She started to work for the Early Music Organisation first as a volunteer, later as a professional member of the team, and has a special interest in young musicians and new ensembles just starting their careers. In this capacity she met João Rival and became involved in the founding of Le Concert d’Apollon as business manager and producer. Apart from her activities for Le Concert d’Apollon Judith still works for the Early Music Organisation as producer of the Fringe concerts which are part of the Utrecht Early Music Festival.